I'm about to recover from my workaholism after an extremely busy year in Edinburgh. I've spent the last weeks hiking and biking in the Norwegian mountains. The holidays are over, now it's back to work. This blog post shows how statistical data on a subnational level can be visualised with KML. "Official statistics and analyses based on statistics shall provide the general public, businesses and the authorities with information about the structure and development of society. Such information strengthens democracy and forms the basis for a sustainable economic, social and environmental development. To this end, official statistics must be produced on an impartial basis, be of a high quality and made available for the common good of society." "Statistics Norway permits the material on these pages (text, statistical tables and figures) to freely be stored, printed, copied and circulated. The permission assumes that reference is to be given in direct connection with each table and figure that are used (Source: Statistics Norway)." Population in municipalities of Norway 2007 from thematicmapping.org on Vimeo. 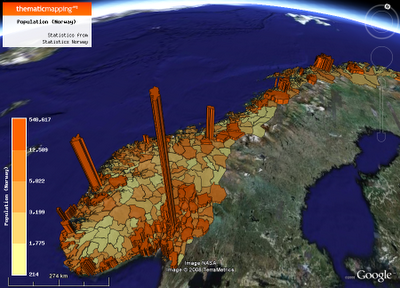 The above image and video (download KMZ) show the 2007 population in municipalities of Norway, visualised as a 3-D prism map in Google Earth. The boundaries were downloaded from the Second Administrative Level Boundaries (SALB) dataset, edited according to the latest consolidations, and simplified using MapShaper (the Douglas-Peucker algorithm returned the best result). Population in municipalities of Norway 1951-2007 from thematicmapping.org on Vimeo. Norwegian municipalities are undergoing continuous consolidation and the boundaries in use only represent the current state. Historic boundaries are needed to display the population dataset properly. Nice entry BJØRN...I hope some day many countries (including mine, Argentina) will understand the concept about the importance of developing and sharing national geodata. And not only in web map format but in downloadable files, so anyone could use them. What is happening is that governments forget the fact that they produce that data with money given by citizens...so the data is ours. I noticed Salb only offers borders at the provices level in belgum. If you're looking for border data for the EU countries, the Eurostat site has a downloadable pack of shapefiles and their NUTS classification - including for the UK.